Lycopene is the ‘redness” found in tomato products. In fresh red tomatoes, Lycopene occurs as the major pigment (Lycopersicon esculentum, 85 – 90%). Other pigments present are beta-carotene (10- 15%) and small quantities of about 10 other varieties of carotenoids. The outer skin of the tomato contains the highest concentration of lycopene. The lycopene content of tomatoes is dependent on plant species and growth location, and increases with ripening as the season progresses. Traditionally, lycopene has been extracted from tomato skin (also called tomato pomace) or paste/purée and a correlation to lycopene concentration developed based on HLPC or spectrophotometric transmission measurements using a 10 mm path length cell. Most users have an interest in estimating the concentration of lycopene in either a slurry extraction from the tomato skins, or in processed tomato products such as paste/purée, sauce, catsup and juice. Lycopene concentration would not typically be estimated in tomato-blended products such as salsa and soups. “Lycopene Index” used as a colorimetric measurement to estimate lycopene concentration does not have a universal definition. While there are correlations to lycopene concentration cited in literature, all are dependent on the method of sample preparation and measurement. 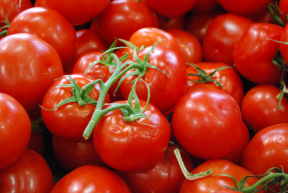 While traditional analytical methods use transmission, a lycopene correlation can also be determined in reflectance as lycopene is found as the redness in tomato products most of which have a high solids level allowing a reflectance correlation method. In the Lycopene Index correlation found in CFEZ Tomato firmware, the client measures and correlates a/b color ratio to lycopene concentration determined by traditional analytical methods. where gain is user-editable = 0.0039 as default and offset is user-editable = 0.3319 as default. The a/b ratio is determined from Hunter a and b color values, fixed for C/2 conditions, and measured on a directional 45/0 geometry instrument. a/b Ratio = 0.0039 Lycopene Index + 0.3318 which if you turn it around becomes Lycopene Index (mg/kg) = (a/b – 0.3318)/0.0039 where a/b ratio is determined from Hunter a and b, C/2 values. Barrett and Anthos used tomato paste samples diluted 10:1 for a/b measurement with lycopene concentration expressed in mg/kg determined analytically in the undiluted state to define the LI to a/b ratio relationship above. Other HunterLab clients have found that dilution of tomato paste/purée to a 1 Brix level also works well. Fit the ColorFlex Tomato meter with a sample cup port. Standardize the ColorFlex Tomato meter using the Black Glass and calibrated White Tile instrument standards. If a Tomato Tile is available, as an optional PQ (Performance Qualification) step, read and baseline the a/b ratio of the tile on the first day. Then read back the Tomato Red Tile daily as a sample after standardization and verify that the a/b ratio matches the baseline values for the tile over time. Reading the Tomato Tile as a PQ Performance Qualification step is encouraged but hitching to the Tomato Tile is not required for lycopene determination. Dilute the sample to an appropriate level (must always be consistent). 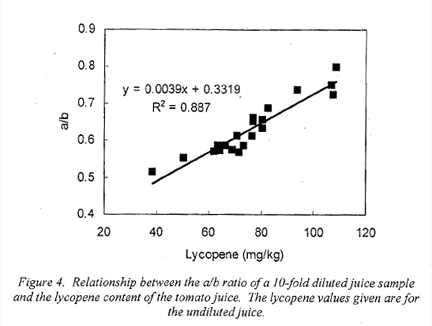 Read a/b ratio and correlate it using a user-defined relationship to the lycopene concentration.